I have been in a bit of a blogging slump lately. I had a few baked good duds last week and since then, I haven’t had motivation to cook, bake, or blog. It is something that happens to me every few months and it’s one of those things that you really can’t force. But if there’s one thing I know, cupcakes can bring just about anyone out of a funk. To make the cupcakes, preheat the oven to 350F. Line two cupcake pans with paper liners (about 20). In the bowl of a stand mixer fitted with the paddle attachment, combine the butter and brown sugar. Beat together on medium-high speed until light and fluffy, about 3 minutes. Mix in the eggs one at a time, beating well after each addition and scraping down the sides of the bowl as needed. To make the frosting, beat together the butter and brown sugar in the bowl of a stand mixer fitted with the paddle attachment until creamy. Mix in the confectionersâ€™ sugar until smooth. Mix in the salt, milk, and vanilla extract until smooth and well blended. Frost the filled cupcakes as desired, sprinkling with mini chocolate chips for decoration. 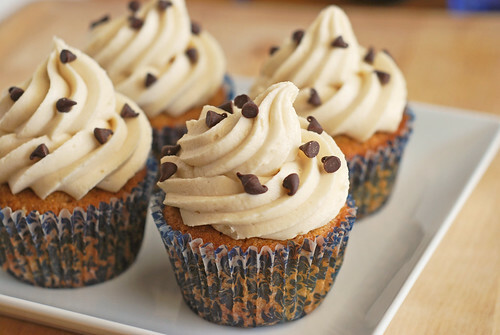 31 Responses to "Cookie Dough Cupcakes"
.-= Kim´s last blog ..Beignets la ricotta et au citron =-. My SIL made something similar but didn’t look anything like yours. I think she made a version that called for cooking the dough within the cupcake. I think I like the version you’ve shared much more as I’d imagine the cookie dough won’t ever get hard like a cookie unless you leave it in the fridge – right? .-= Rachel´s last blog ..Slow Cooker Italian Wedding Soup =-. Yeah, I kept mine in the fridge and the cookie dough was almost exactly like the refrigerated kind you can buy. Same texture, taste, everything. Beautiful! Can’t wait to try. .-= jenna laughs´s last blog ..salsa chicken rollups =-. Looking great, as always! I love the cute paper liners you find! Those are beautiful! I can’t wait to try these! .-= Mary´s last blog ..Pumpkin Cream Cheese Brownies =-. Mmm, my two favorite things in life, cookie dough and cupcakes! Sounds and looks great! .-= Pretty. Good. Food.´s last blog ..Our Quest for the Best Burger in the Whole Entire World =-. 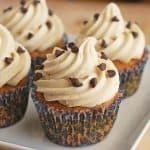 I keep seeing these on blogs and am dying to make them, I just need to find people I can pawn them off on so I don’t eat 20 cupcakes!!! .-= natalie (the sweets life)´s last blog ..Chicken Black Bean and Goat Cheese Tostados =-. I’ve made these before, too- so delicious! Yours look adorable. They sound delicious! I will be putting these on my list of cupcakes to make. I want to bake more so one of 101 things in 1001 days is too bake a cupcakes once a month for a year. I am going to start in January and try a new flavour each month. These will definately be making an appearance. They look beautiful. Husband LOVES cookie dough but isn’t into cake. Maybe these will convert him, worth a try FOR SURE!!! .-= Julia´s last blog ..Lemonade Coconut Cake =-. gah! amazing! i am a cookie dough fanatic. i need to make these right now! well, maybe not right now (i’m in the middle of a movie), but soon. very soon. .-= Mallory´s last blog ..Mary Poppins Pick for 10-27-10 – Susan Estelle Kwas =-. yum yum yummy :))) I’d eat them all!!! A cupcake that tastes like a cookie? Sounds good to me. Thanks for sharing this recipe. .-= Chele´s last blog ..Three Cheese Ravioli with Sage Brown Butter =-. These look fantastic! Mind if I feature them on a Saturday Stumbles post tomorrow? My husband would love them! Thanks! .-= Debbi Does Dinner Healthy´s last blog ..Chile Verde in the Slow Cooker =-. Sure, that would be awesome! Thanks! These are a huge favorite of mine! .-= shelly (cookies and cups)´s last blog ..Pumpkin Pie Pop Tart Cupcakeswink wink =-. I made these for my son’s birthday and they were great… EXCEPT for the frosting. It was way too buttery. I’m not sure if it called for so much butter because of the brown sugar or what but next time I’m going to try a more standard butter to sugar ratio and use more cream. I cannot wait to try these! And your cake version is beautiful! I just wanted to add that the “cookie dough” needs salt. i used 1/8 tsp to get the taste of the real stuff. Awesome recipe…can I make these the day before my son’s party or am I better off making them day of? I made these yesterday for a grad party. I was short on time so I did use a box mix for the cupcake but it was really all about the filling and icing anyway. Everyone LOVED them! Even the ones who are not big on desert had seconds! I already have requests to bring these it other parties in the near future. Thanks for the recipe! For the edible cookie dough, can dry milk be used in place of the flour? I just don’t want the dough to have a floury taste.